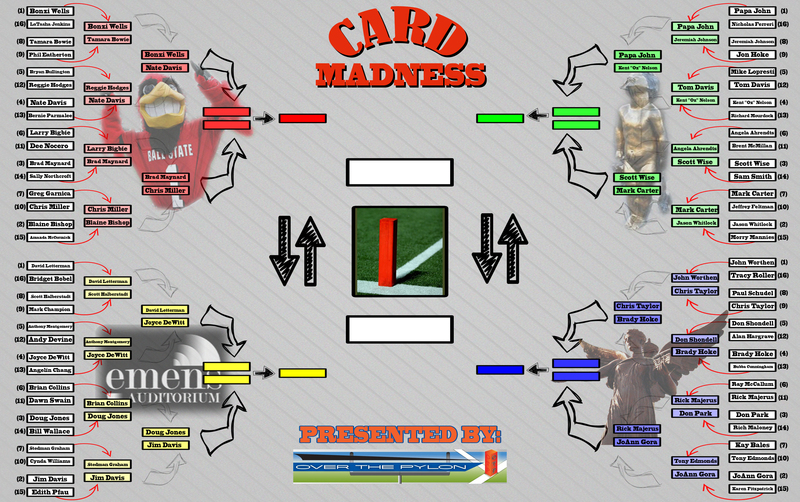 Card Madness began with 68 BSU alums vying for glory and fame as the first ever champion of the OTP Ball State bracket. Today marks the kickoff of the Sweet 16, and what a Sweet 16 it is. Actors, late night talk show legends, pizza makers, package deliverers, former coaches, current presidents, Brewhouse namesakes, and everyone’s favorite hot dog slinger. It’s been a tremendous success so far, and our Sweet 16 can see the homestretch of the Final 4. The only thing standing between them and the promised land are 15 other competitors and the votes of you, their supporters. We’ve seen social media play a huge role in this tournament. It was nearly responsible for an epic first-round upset of #1 overall seed David Letterman as 16-seed and play-in game winner Bridget Bobel lost a heartbreakingly close contest. The moral of that story is anyone is capable of winning this thing with the right amount of fanfare. Facebook it, Tweet it, email it, whatever you need to do to make people aware that your favorite needs their support. Yesterday our Charlie Cardinal and Emens Entertainment Regionals determined their semi-finalists as Bonzi Wells, Chris Miller, David Letterman, and Jim Davis advanced to make one half of the Elite 8. They’ll be back in action on Thursday as we decide half of our Final Four, but we have some unfinished business to tend to first. Today, we decide who joins the aforementioned first half of the Elite 8. You can check out round 1 results here and here, our round 2 results here and here, as well as our most recent bracket (pre Sweet 16 games) with winners here. Present versus past in one of our Benny Regional Semi-finals as President Gora and former coach Rick Majerus square off. 2-seed JoAnn Gora is our current President and has led the University through massive overhauls, upgrades, renovations, and change. Ask any alum who goes back to campus and they will say it looks remarkably different, considerably better, and impressively awesome. That is thanks in no small part to President Gora. She defeated 15-seed Karen Fitzpatrick 67%-33% in round one and beat 10-seed Anthony Edmonds 73%-27% in round 2. 11-seed Rick Majerus led BSU to a 43-17 record over his two seasons in Muncie including the school record of 29 wins in 1989. Majerus went on to win 500 games including a National Runner Up title and spent time with both Utah and St. Louis. He defeated 6-seed Ray McCallum 51% to 49% in round 1 and 3-seed Don Park 62%-38% in round 2. Our other regional semi-final sees an architect of the football program versus the man who built the program that covers it like never before. 4-seed Brady Hoke was not only a player on one of Ball State’s most successful teams, he led the Cards as head coach on the 2008 undefeated season. Readers of this blog, fans of BSU football, and anyone who has had an eye on the Cards knows Brady Hoke and what he was able to accomplish in his time at the helm. Hoke defeated 13-seed Bubba Cunningham 93% to 7% in round 1 and 5-seed Don Shondell 62%-38% in round 2. 9-seed Chris Taylor currently oversees Ball State’s nationally renowned SportsLink program that is the best in immersion programs for communication. Taylor’s work has allowed the students’ work to appear on national broadcasts through Fox and ESPN. He’s also saw the program handle production duties for the NCAA Tournament and even the Olympics. And oh by the way, Taylor’s also a BSU alum. He defeated 8-seed Paul Schudel 79%-21% in round 1 and beat 1-seed John Worthen 78%-22% in round 2. It’s an epic pizza vs. postage showdown in the Frog Baby “Other’ Regional for the right to play for the Final 4. 1-seed “Papa” John Schnatter is perhaps the most famous pizza maker on the planet. Papa John’s has become an international brand and Schnatter himself has been inducted into the Junior Achievement U.S. Business Hall of Fame in 2007, was named one of the Ten Outstanding Young Americans in 2000 by the National Jaycees Organization, was named 1998 National Ernst & Young Retail/Consumer Entrepreneur of The Year and was inducted in to the Kentucky Entrepreneur Hall of Fame in 2010. Papa John defeated 16-seed Nicholas Ferreri 91%-9% in round 1 and 8-seed Jeremiah Johnson 53%-47% in round 2. 4-seed Kent “Oz” Nelson is the retired chairman and CEO of everyone’s favorite brown-uniformed delivery service, UPS. He has also served in numerous charitable capacities as chairman of the Annie E. Casey Foundation and United Way of America and Atlanta. Nelson was awarded the Distinguished Alumni Award and has been elected to BSU’s business Hall of Fame. He defeated 13-seed Richard Mourdock 80%-20% in round 1 and 12-seed Tom Davis 62%-38% in round 2. It’s a village food battle as two titans of campustown go head to head for the a Frog Baby Regional Final. 3rd seeded Scott Wise, or more affectionately known as “Scotty” is making a name for himself throughout the state of Indiana as an entrepreneur and business-owner. The man behind Scotty’s Brewhouse in Muncie has taken his concept throughout the Hoosier state as there is a Brewhouse in West Lafayette, Bloomington, Muncie, three in Indianapolis, and coming soon to Mishawaka. He also opened Three Wise Men brewing company and restaurant in Indianapolis and has become a sought after motivational speaker. Wise defeated 14-seed Sam Smith 93%-7% in round 1 and 6-seed Angela Ahrendts 68%-32% in round 2. 7th seeded Mark Carter may very well be as recognizable as the campus President. Any Thursday, Friday, or Saturday you can find Mark with his cart in the Village serving up delicious hot dogs. Hot Dog Man is a Ball State staple and was even featured in Sports Illustrated as things someone must do on a college campus. He defeated 10-seed Jeffrey Feltman 87% to 13% in round 1 and 2-seed Jason Whitlock 53%-47% in round 2. Voting will remain open until 8pm tonight. Tomorrow sees the Charlie Cardinal Regional and the Emens Entertainment Regional crown a champion and decide half of the Final 4. Friday will be the regional finals for the Final Four berth for the matchup winners above. Spread the word, click away, make it happen for your favorite.